I have currently 60 gitmob grots with bows and 20 with sword and board, all re-based on rounds. I would like to use them as Moonclan, but obviously have no netters. All but 20 are metal and those I have that are not re-based are metal. Does anyone have any suggestions on how I could turn 12 old grots into netters and what to use for netting? Any help would be greatly appreciated. I have some old metal fanatics that I could cut the ball off the chain and attach net to it, but i only have 4 of them. I know it sounds like sacrilege, but I bought them new and I'm not going to sell them - I would like to give them a new life. Maybe you could use wire modeling mesh and create some nets. I absolutely love the squig models, just getting into AOS. Would an all squig army work? Also with no start collecting how should I go about it? Mangler and some hoppers and herds to start off? What's a good 1k list for squigs? You can always find some of the old metal Night Goblin Netters to match with your metal Gitmob. 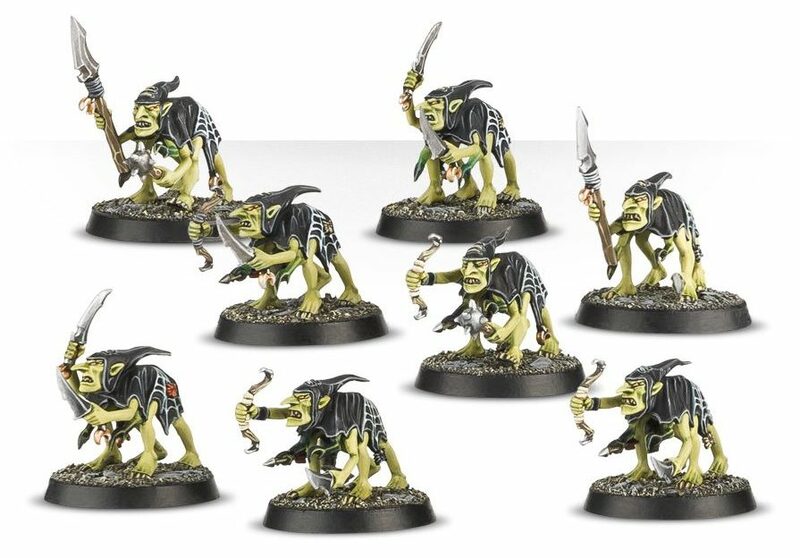 They probably will not match well but grot scuttlings are cheap to find and make a decent netter "count as"
I'm looking to expand my Gloomspite with a Troggoth Hag but I've got an idea about making a sort of dankhold shaman type conversion instead of spending a whole lot of money on the forgeworld model. Does anyone have any good alternate models? I'm not too fussed about it being GW, I don't really play in official tournaments. This is what I would do. Check out ebay as you can usually find some of them floating around there and if you keep an eye out you can usually find a good deal. Hard to really say without much more about the sort of conversion you are making and what you want to use as a base. It also depends on the price range you are looking at. Without knowing any of that I'll say that there are a few models throughout the Darklands range from Mierce Miniatures that could work as a nice base for a Troggoth Hag conversion. I am considering using a few of them to make some alternate Troggoth Hag models since I don't like duplicate miniatures and I think I would like to play some troggoth lists with multiple Hag models. Anyone managed to build a proper 2k list based on Gobbapalooza? I really love the models, but somehow I just cant find an optimal list for them. 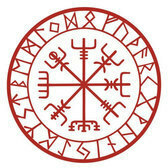 I know that pure moonclan is the way to go, but still, I dont really know how to build the list around them. Stabbas. Everyone loves em. But do you think every list requires them? They seem a bit lackluster without the Loonboss, Snufflers, and Fanatics to buff them. And if you're unable to take the full 60, they might get whittled down pretty easily. 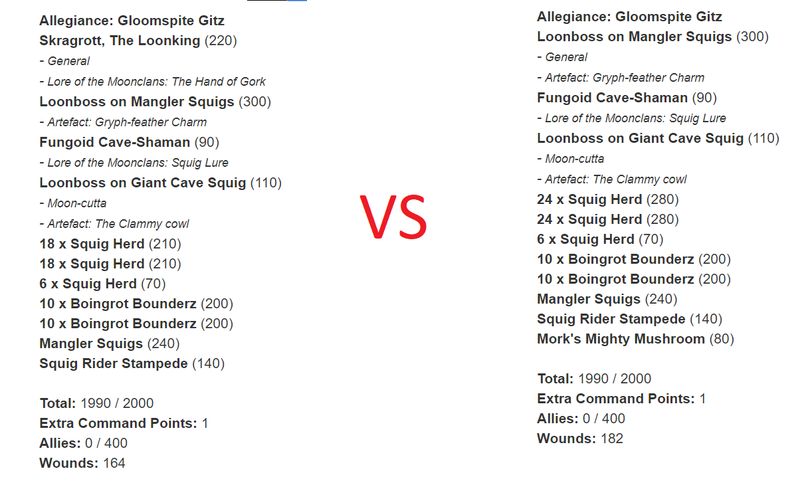 So the question is, if you can't take the requisite 640+ points for the full wombo combo, do you think they belong in specialized lists like Troggherds, or Squigalanches? I mainly run Squigs, so I'm wondering if its worth taking a minimum sized 40man shootas/stabbas unit (or 2x20 shootas/stabbas) without support. If I cut back on some squig stuff, I can fit things like a Loonboss or Snufflers, but at that point, is it worth it if my main force isn't pure grots? I think for Troggs/Spiderfang a big block of Stabbas is such an important unit to have. For Squigs I actually think you cut the Grot units and take big units of Squig Herds instead. Having played against them and looked at their stats again they are really well priced and synergise with everything you're trying to do as a Squig primary army, they even benefit from all your buffs. Something like this. There's quite a bit of play around the last 300-400 points or so but in terms of raw wounds on the board, movement potential and MW output this list is up there with skaven in terms of disgusting. I think every list can do with 60 even without a single buff. Its 360 points for 60 bodies/60 wounds with a -1 to hit aura that can be Hand of Gorked. Gloomspite are not short on CP so you will almost always be able to pass a battle shock test with IP. AOS is a game of objectives so I find it hard to believe you won't want 60 sitting on an objective in almost every game you play. Funny enough, I'm planning on running this list come Friday. It's basically the same, but with another mangler and Mork's. Unsure if a second wizard is really important for squigs but itchy nuisance is hard to pass up, and might be more worth than the Mushroom. That is a pretty decent starting point for an all squig list. I might take this one for a spin although I will probably swap out the battalion for 2 units of Snufflers. I like the battalion, but I think in a list like this I would prefer to buff up the cave squigs a bit more. But that is just a personal preference thing. Unless I am after the extra relic for the battalion I am of the opposite opinion. I personally think the squigalanche battalion has too many requirements since it is a sort of mega-battalion and I am not totally sold on the ability it grants. Being able to be selected to fight from 6” away and also pile-in 6” is a fantastic ability.  However the battalion bonus is conditional upon the badmoon and that generally means you will probably only really get the ability for one turn and it is hard to plan when that turn is unless you have Skragrott. I am prone to making the opposite choice and when playing with a large contingent of Squig Herds to forgo the battalions and instead go for buffs that you can use when you need. The Squigalanche is neat, but to me that battalion really funnels into a fairly specific list. For Squig Rider Stampede I generally prefer if I am going heavy into hoppers and Bounders. To me, a list that has at least 2 max units of Squig herd and also a shaman with the mommet is going to heavily function around those units as the core and I like the snufflers to make those units even more dangerous. For hopper heavy lists the snufflers are not that useful since they won’t be able to keep up and in that case I like the battalion. But it’s a personal preference thing - play whatever fits best for you. Quick one - would the nets -1 to hit and the fellwater -1 to hit stack for minus 2 to hit if an enemy wants to attack the trolls? Yes they would, it's a good combo. The Fellwaters can hit / vomit over the top of them too. They're crazy expensive to get down here to NZ...about $12 each plus shipping which can be insane. And the likelihood that you'll find all that you need in one lot is basically nil. I've been scrapping for good netter deals for almost a year now and I have a total of 9. This is the bad side of buying cheap Battle for Skull Pass boxes that no one seems to find out about until they have 200 stabbas and 0 netters. The're crazy expensive to get down here to NZ...about $12 each plus shipping which can be insane. And the likelihood that you'll find all that you need in one lot is basically nil. I've been scrapping for good netter deals for almost a year now and I have a total of 9. This is the bad side of buying cheap Battle for Skull Pass boxes that no one seems to find out about until they have 200 stabbas and 0 netters. You couldn't make up a basic net out of craft materials? Yeah man I have already, lol. But I'm trying to phase them out with real netters because I like the aesthetic better.